For the first time since it overtook Japan as the world's second-largest economy back in 2011, China has displayed surprisingly weak economic data that have somehow obscured the widely held, if rarely discussed in public belief that these data, which are compiled by the Chinese state, are largely suspect. Contributing to its goal of maintaining order and stability at home, the Communist Party is widely believed to doctor and goalseek its data to present a rosier picture. Apparently, the notion that this is probably happening has become so widely accepted that investors often lose sight of it. Even experts who are skeptical of the official data dismissed the presentation, delivered by a professor Xiang Songzuo, as unrealistic. Yet despite being scrubbed from Chinese social media and the mainland Internet, the presentation has been viewed 1.2 million times on YouTube (clip above), suggesting that Xiang's warnings are resonating with everyday Chinese consumers, who are struggling with one of the worst-performing stock markets of 2018, a collapsing shadow lending sector, a crackdown on China's vast online peer-2-peer lending infrastructure, and a currency that has weakened significantly over the past 12 months. 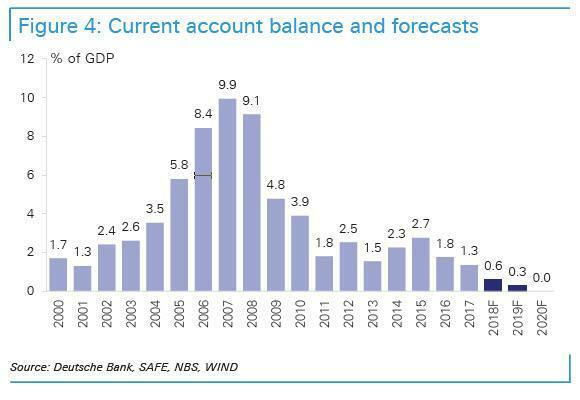 To be sure, (almost) nobody is forecasting a recession in China or even a slowdown to sub-5% growth over the next two years (for the simple reason that Beijing would never allow such an admission due to social instability fears). ...and leading indicators suggest that the slowdown will continue. At the end of 2018, the China Beige Book (CBB) fourth-quarter preview, released Dec. 27, reported that sales volumes, output, domestic and export orders, investment, and hiring all fell on a year-over-year and quarter-over-quarter basis. A much-weaker 2019 appears to be in the offing for China, but it’s not solely due to trade tensions with the United States. The domestic economy was already on weak footing and the CBB argues that government support is unlikely. At least one prominent financier who has an on-the-ground view of Chinese consumer sentiment says the mood is more dour than even the depths of the financial crisis. And since this will likely continue to constrain private spending and investment, the big question on every domestic investors' mind is will the Chinese government revive its stimulus efforts, like one powerful committee of economic policy makers recently promised to do? "Domestic sentiment is definitely very bad, perhaps even worse than during the 2008 global financial crisis," said Fred Hu, founding partner of Primavera Capital, a Hong Kong-based private equity group, and former Greater China chairman for Goldman Sachs. "In theory, China has wide latitude to boost domestic demand to offset the trade war hit on external demand. But with sagging business and consumer confidence, private spending on both capital expenditure and personal consumption is more likely to trend down." Far from being some impossible task, bypassing China's opaque official statistics is as easy as recognizing that there are other measures that are more difficult to falsify. And these indicators still point to relatively robust growth. Huang Yiping, vice dean at Peking University’s National School of Development, who stepped down from the People’s Bank of China’s monetary policy committee in June, acknowledges that the official growth rate may be overstated. But he says that the so-called "Li Keqiang Index" - a gauge of tamper-resistant indicators such as electricity production and freight volumes, which premier Li Keqiang privately told a US ambassador in 2007 that he views as more trustworthy than GDP - still points to growth of "6 per cent or slightly below." But more importantly, one individual who spoke with the FT pointed out, to a significant extent, the slowdown is largely the government's own fault (for having the gall to try and force through some macroprudential deleveraging). Starting in mid-2016, policy shifted from stimulus to austerity, a response to years of warnings about financial risks from a rapid debt build-up. A "regulatory windstorm" targeting shadow bank lending, which had channeled loans to the riskiest borrowers, led to a sharp drop on off-balance sheet credit. Tighter credit combined with stricter environmental enforcement and a drive to shutter low-end factories — part of Mr Xi’s broader call for a "new era" in which growth quality would take priority over quantitative targets. "To some extent the slowdown is a result of the government’s own priorities. China is transitioning from relatively low cost to high cost, so a lot of old industries need to be shut down," says Huang Yiping, vice dean at Peking University’s National School of Development, who stepped down from the People’s Bank of China’s monetary policy committee in June. "The key economic policy battles like cleaning up the environment and containing financial risk all contributed to the slowdown in economic activity," he says. More recently, Beijing appears to have gotten second thoughts about its deleveraging campaign, although the government’s light-touch approach to stimulus reflects the reduced policy flexibility today compared with 2008, when debt levels were lower and a simpler growth model based on investment in housing and infrastructure had more room to run. And yet, Beijing's restrained stimulus has left markets underwhelmed, with China's stock market tumbling 25% in 2018. ... which in turn is creating serious disruptions in capital flows that could portend weakness beyond China's borders, assuming the trade war continues to impede the foreign investments that China's increasingly consumption-based economy needs to expand.